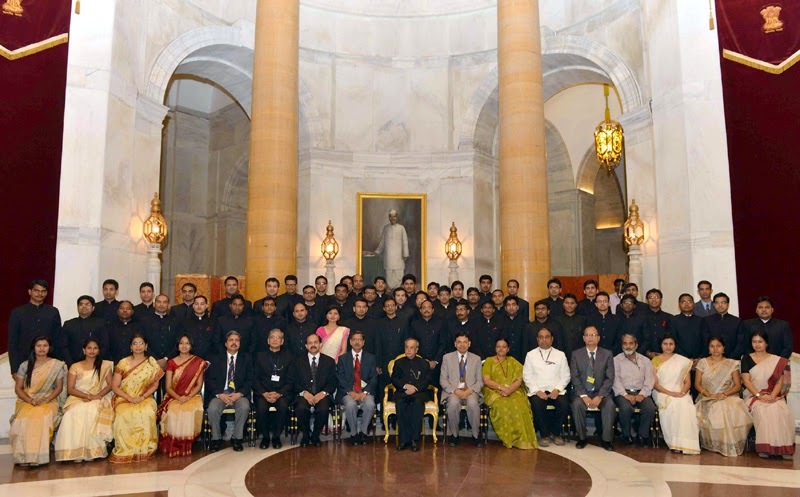 A group of probationers of Indian Railway Traffic Service, Indian Railways Accounts Service, Indian Railways Personnel Service, Indian Railways Stores Service, Indian Railways Service of Engineers and Railway Protection Force called on the President of India, Shri Pranab Mukherjee today (May 6, 2015) at Rashtrapati Bhavan. 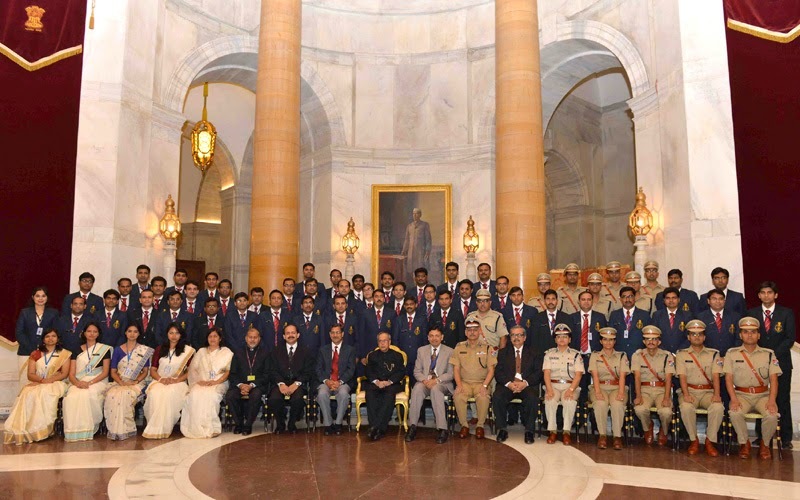 Speaking on the occasion, the President congratulated all probationers for having cleared what is universally recognised as one of the toughest competitive examinations in the world. He stated that the canvas, scope and breadth of exposure and responsibility that a career in Government offers, and that too at a relatively young age, is an experience and opportunity unlike any other. 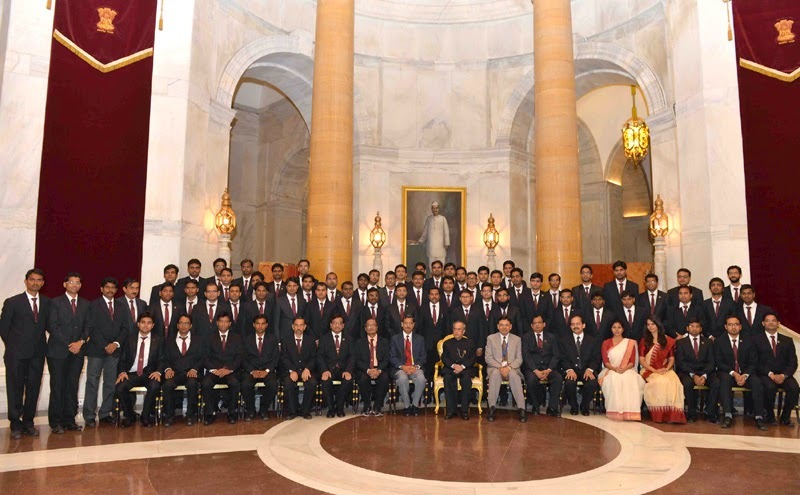 The President told the probationers that they have joined one of the oldest Railway systems in the world, one which is a 162 years old. Indian Railways is one of the most important infrastructure systems anywhere in the world in terms of size, range of operations, and its reach and impact. It is the virtual lifeline of the nation with nearly 66,000 route kilometers. It runs more than 19,000 trains daily and carries 25 million passengers every day which is almost equivalent to Australia’s population. The Indian Railways has also now joined the select club of 1 billion tonnes plus freight loading Railways, globally being only the fourth to do so. It serves as one of the great unifiers of our country given its unparalleled reach and operational depth. He told that Railway finances were separated from general finances in 1924 and the practice of presenting a separate railway budget has been in vogue since then. The gross traffic receipts of the railways have also grown exponentially from Rs. 183 crores in 1947 to Rs. 1.59 lakh crores in 2014-15. The progress of the Indian Railways is unthinkable without the active involvement of each one of its vast number of employees. The President said that probationers have to look after range of services from traffic operations to financial management, to manage human resource development and large number of employees, track renewal, safety, security and also improving quality of services in Railways. Opportunities which they have received in an important sector of Railways, which is lifeline of our economical life, is crucial. They should serve nation their best they can give from themselves. He called upon them to uphold the high standard and dignity which has been maintained over the years. The Vice President, Shri Mohd. 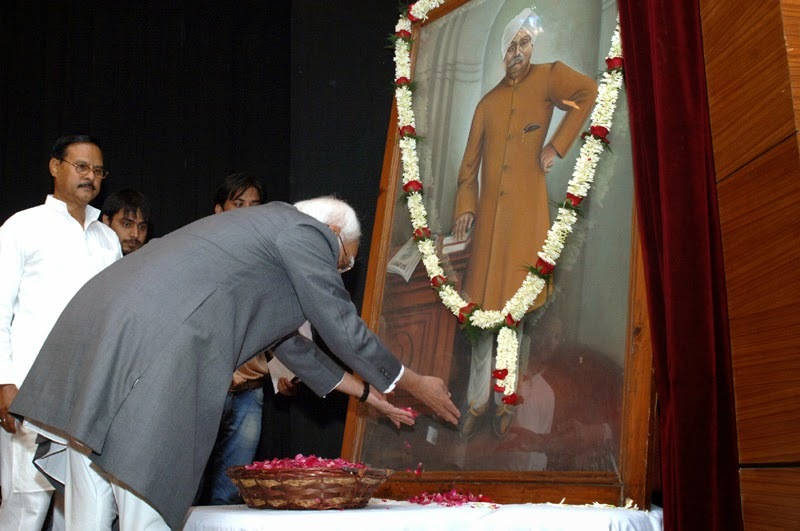 Hamid Ansari paying floral tributes at the portrait of Lala Lajpat Rai on his 150th Birth Anniversary celebrations, organised by Servants of the People Society, in New Delhi on May 06, 2015. The Vice President of India Shri M. Hamid Ansari has said that Record shows that leaders of the freedom movement having varying or conflicting viewpoints struggled with competing impulses on political and societal challenges that surfaced in the twenties and thirties of the last century when so many of these perception crystallised. Closer scrutiny also shows that a lesser dose of cultural bias and a greater element of cultural accommodation may have brought forth greater harmony. Delivering inaugural address on the Theme : ‘Patriotism, Nationalism and Social Peace: Some Aspects of Lala Lajpat Rai’s Ideas’ at the “150th Birth Anniversary Celebrations of Lala Lajpat Rai organised by Servants of the People Society” here today, the Vice President said that since conflicting ideologies were embedded in or attributed to identities of faith, it is a moot point whether a different approach may have produced less painful outcomes. In this context, the October 1923 Appeal for Inter Communal Harmony that pegged better conduct to the imperatives of the individual faiths themselves, may just have had a more lasting impact and caused lesser trauma. He said that the history of the early decades of the last century is in places characterised by competing narratives. Different elements in the national movement, in agreement on the final objective, did not always converge in terms of methodology and tactics. There were varying perceptions about how ‘the constitutional space offered by the existing structure could be used without being co-opted by it.’ The Non-Cooperation Movement, while it lasted, brought about a unity of ranks. Its demise, and other happenings in that period, aggravated communitarian tensions with resultant impact on leaders of opinion. The Vice President opined that the evolution of national movements in contemporary history is a complex endeavour. In our own case and given the societal and historical complexity of the Indian landscape the impulses emanating from patriotism, nationalism and social peace or harmony need to be carefully assessed to determine the positive energy and negative vibes emanating from their collective impact on a fast evolving situation. The role of individual actors on the scene thus assumed a role in the shaping of public perceptions. At times, their own perceptions underwent changes of a far reaching nature. “It is a privilege to be invited to join this august gathering in celebrating the 150th birth anniversary of a legendry personality of our freedom struggle. I thank Ved Prakash Vaidik ji and Swami Agnivesh ji for urging me to participate. Many years back, and in another context, I had read the October 1923 Appeal for Inter- Communal Harmony signed by100 public figures of all faiths. Lala Lajat Rai’s name is the first on this list. The text is given in volume 10, page 404 of Lala ji’s Collected Works and the names of all signatories is available in volume 4, pp 496-503, of the Selected Works of Motilal Nehru. The Appeal’s approach to the question was unique: that indulging in communal misdeeds is a sin in religious terms and it is ‘the duty of co-religionists of such offenders’ to resist it. Since the question of social harmony regrettably continues to remain on our national agenda, I propose today to have a closer look at Lala Lajpat Rai’s perceptions on these and related matters. My purpose is to discern the manner in which an earlier generation, principally of eminent freedom fighters, sought to address it and to benefit from their successes and shortcomings. The latter, in hindsight, were many and have been written about by scholars. The history of the early decades of the last century is in places characterised by competing narratives. Different elements in the national movement, in agreement on the final objective, did not always converge in terms of methodology and tactics. There were varying perceptions about how ‘the constitutional space offered by the existing structure could be used without being co-opted by it.’ The Non-Cooperation Movement, while it lasted, brought about a unity of ranks. Its demise, and other happenings in that period, aggravated communitarian tensions with resultant impact on leaders of opinion. Many in this audience know that tracing the evolution of national movements in contemporary history is a complex endeavour. In our own case and given the societal and historical complexity of the Indian landscape the impulses emanating from patriotism, nationalism and social peace or harmony need to be carefully assessed to determine the positive energy and negative vibes emanating from their collective impact on a fast evolving situation. The role of individual actors on the scene thus assumed a role in the shaping of public perceptions. At times, their own perceptions underwent changes of a far reaching nature. The situational imperatives also had theoretical moorings. Influence of thinkers like Mazzini and his ideas on cultural nationalism were evident in the writings of some Indian activists, including Lala ji. He presided over the annual session of the Hindu Maha Sabha at Calcutta in April 1925 and the programme of action adopted there has been called by a credible scholar as ‘the single document that had the most enduring influence on subsequent programmes and strategies’ of some of the successor organisations of that persuasion. This change of direction, or absence of consistency in the thought process and practical commitment, brings to the fore competing versions of nationalism that characterised the Indian scene in that period, versions that underlay the strong sentiments of patriotism that were evident at all stages. Were these versions liberal and inclusive, or restrictive and exclusive? This had practical implications in the shape of a direct impact on strategies of attaining social peace. Record shows that leaders of the freedom movement having varying or conflicting viewpoints struggled with competing impulses on political and societal challenges that surfaced in the twenties and thirties of the last century when so many of these perception crystallised. Closer scrutiny also shows that a lesser dose of cultural bias and a greater element of cultural accommodation may have brought forth greater harmony. Since conflicting ideologies were embedded in or attributed to identities of faith, it is a moot point whether a different approach may have produced less painful outcomes. In this context, the October 1923 Appeal for Inter Communal Harmony that pegged better conduct to the imperatives of the individual faiths themselves, may just have had a more lasting impact and caused lesser trauma. I thank the organisers for inviting me today. Shri Kapil Dev, renowned cricketer and Chairperson of Khushii (Kinship for Humanitarian Social and Holistic Intervention in India), called on the Prime Minister, Shri Narendra Modi, today. 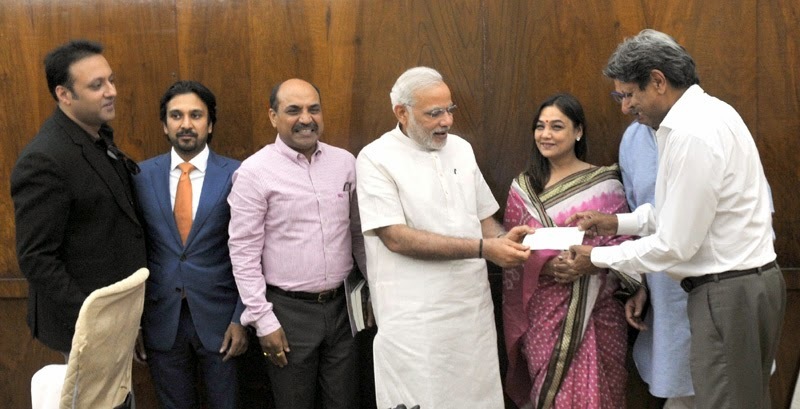 He presented a cheque of Rs 51 lakhs for the Prime Minister's National Relief Fund on the behalf of Khushii to the Prime Minister. The Department of Atomic Energy (DAE) has developed and deployed technologies to use atomic energy in the areas of electricity generation, nuclear agriculture, food preservation, healthcare, isotope hydrology, research, development and deployment in areas pertaining to national security, etc. Ionizing radiation has been used to induce mutations in plant breeding to develop new crop varieties having better yield, stress resistance and early maturity. Radioisotopes have been used for clinical diagnosis and therapeutic purposes. They are also used for treating cancer and sterilizing medical products. The gamma rays emanating from radioisotopes are also used to increase the shelf life of food products. In addition, Bhabha Atomic Research Centre (BARC), a constituent unit of DAE has also developed several desalination and water purification technologies for application in rural areas. Using Isotope hydrology techniques employing radiotracer, studies are carried out for recharging the underwater resources and improving the ground water levels. In order to support the above mentioned fields of activities, a large number of projects are being implemented by the Government. An outlay of approximately Rs.1700 crore has been provided under XII Plan for projects under Radiation Technologies and their applications. The recent visit of the Prime Minister to France and Canada has facilitated forward movement in cooperation agenda identified under the civil nuclear cooperation agreement with these countries and opened up new avenues for mutually beneficial cooperation in peaceful use of nuclear energy with these countries. During Prime Minister’s visit to France (April 10-11, 2015), Nuclear Power Corporation of India Ltd. (NPCIL), a PSU under the Department of Atomic Energy, and M/s AREVA of France entered into a Pre-Engineering Agreement (PEA) in connection with the proposed Jaitapur Nuclear Power Project to be constructed with French collaboration. The PEA will facilitate NPCIL to obtain details of the French technology, make a detailed safety assessment of the plant and take up the licensing process with India’s Atomic Energy Regulatory Board (AERB), as soon as the Jaitapur Nuclear Power Project is taken up for implementation. During the same visit, a Memorandum of Understanding (MOU) was also signed between the Indian company L&T and M/s AREVA of France on April 10, 2015 for cooperation to maximise localisation for the French-designed nuclear reactors in India. The collaboration, through transfer of technology, is expected to facilitate manufacturing in India of many critical components for the proposed Jaitapur Nuclear Power Project, and is in accord with the “Make in India” campaign of the Government aimed at enhancing indigenous technological and manufacturing capabilities of Indian industries. During Prime Minister’s visit to Canada (April 14-16, 2015), the Department of Atomic Energy entered into an agreement with M/s. CAMECO, Inc., Canada for supply of 3000 metric tonnes of Uranium Ore Concentrate during the period 2015-2020. Canada is one of the world’s largest producers of uranium, and M/s. CAMECO Inc., Canada, is a uranium supplier of global standing. The uranium provided under the contract will be used for manufacturing in India of nuclear fuel for the Indian nuclear power plants under the International Atomic Energy Agency (IAEA) safeguards. It will further enhance the utilisation of India’s installed and upcoming nuclear power generation capacity. The agreement is of direct significance to India’s long-term energy security, and will facilitate India's efforts to enhance the share of low-carbon energy resources in its total energy mix with a view to address climate change. A total of twenty three Emergency Response Centres of Department of Atomic Energy(DAE-ERCs) have already been set up and are operational at various sites of DAE. The DAE-ERCs are equipped with trained Emergency Response Teams (ERTs) and radiation detection instruments and systems for detection and response to Nuclear/Radiological Emergencies in public domain. These Centres will be able to provide technical support to respond to Nuclear and Radiological Emergencies anywhere in the country including challenges from orphan radioactive sources and malicious acts using radioactive materials. The ERCs will help the nation in reducing the radiological consequences in case any such radiation emergency occurs anywhere in the country. At all nuclear power stations, state of the art safety measures are provided based on principles of redundancy (more numbers than required) and diversity (safety systems operating on different principles). These include fail safe shutdown system to safely shutdown the reactor, combination of active (requiring external intervention) and passive (systems working on natural phenomena and not needing motive power or operator action), cooling systems to remove the heat from the core at all times and a robust containment to prevent release of radioactivity in all situations. In addition, all nuclear power plants are designed to withstand extreme natural events like earthquake, flooding, tsunami etc. Safety features are integral to the design of all components and equipment of nuclear power projects and form part of the project expenditure. Similarly, ensuring safety during operation forms the part of operating expenditure and no separate provisions for safety are made. Indian expertise in nuclear reactor safety is world-class. However, India is actively participating in international efforts in further enhancing safety of nuclear power reactors. India had also invited the Operational Safety Review Team (OSART) of the International Atomic Energy Agency (IAEA) for peer review of an Indian nuclear power station, Rajasthan Atomic Power Station, Units 3&4 which has resulted in sharing of safety related best practices. There have been sporadic instances of resistance for setting up nuclear power plants by some sections of local people at some of the new nuclear power plant sites. The resistance has been mainly on account of issues related to Rehabilitation package, apprehensions about loss of traditional means of livelihood and safety of the nuclear power plants. A large public outreach programme based on a multipronged approach is implemented to address the apprehensions of the people about safety of nuclear power plants and related issues and allay their fears in a credible manner. The issues related to rehabilitation are being addressed in association with respective state Governments. The Indian Space Research Organisation (ISRO) has initiated a process of formulating a National Space Act for India for regulating space activities in India, facilitate enhanced levels of private sector participation and offering more commercial opportunities. Towards this, a two day national workshop was held at ISRO Headquarters, Bangalore during Jan 16-17, 2015 with the participation of experts across the country. A draft version has been prepared, which is under consultation with experts. ISRO is presently implementing the space debris mitigation guidelines endorsed by the United Nations in design and operation of all its space systems. ISRO is also actively participating with various international fora for conducting relative analysis of new techniques for debris removal. India has currently signed co-operation agreements with 35 countries for peaceful uses of outer space. Five international treaties on outer space activities formulated under the aegis of United Nations Committee on Peaceful Uses of Outer Space are already in place. India is a Member State in four major treaties. A Memorandum of Understanding (MoU) between Indian Space Research Organisation and Canadian Space Agency, concerning cooperation in the field of outer space, was signed on April 15, 2015 at Ottawa, Canada during the visit of Honourable Prime Minister of India to Canada. The MoU provides scope for cooperation in the peaceful uses of outer space including Remote Sensing, Satellite Communication & Navigation, Space Science & Planetary Exploration, Capacity Building and Sharing of resources for satellite operations. The Department of Atomic Energy (DAE) is administering the Tata Memorial Centre (TMC), a fully funded Grant-in-Aid Institution under the DAE and provides grant-in-aid to this Institution on regular basis both under Plan and Non-Plan. Further the Department of Atomic Energy has also been providing financial assistance to various cancer hospitals in the country under a programme viz., “Financial Assistance for Development Programme of Cancer Institutions in India” for buying equipment and/or carrying research projects. DAE also supports cancer research projects in universities, when the projects have direct relevance to diagnosis/therapy/instrumentation innovation and upgradation of instrumentation, subject to availability of funds. Bhubaneswar Borooah Cancer Institute (BBCI), Guwahati, Assam. Aligarh Muslim University, Aligarh, Uttar Pradesh. Saroj Gupta Cancer Centre & Research Institute, Kolkata (W.B. ), West Bengal. Shri Siddhivinayak Ganpati Cancer Hospital, Miraj, Maharashtra. Government Rajaji Hospital, Madurai, Tamil Nadu. Punjab Health System Corporation, Mohali, Mohali, Punjab. Kidwai Mamorial Institute of Oncolgy, Bengaluru, Karnataka. Medical College Hospital, Kolkata, Kolkata, West Bengal, West Bengal.